Taking the standard 60ml e-liquid box sizes and giving it a serious twist! 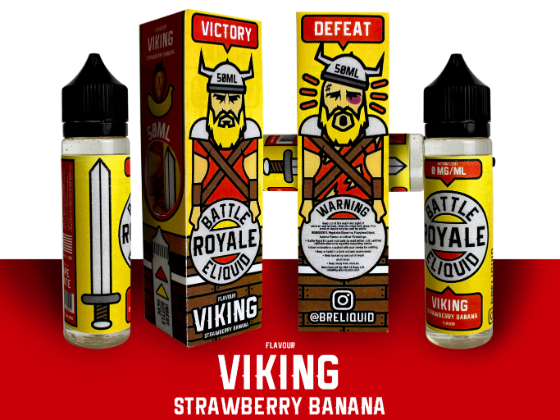 Battle Royale E-Liquid is an e-liquid brand that focuses highly on color, design, and functionality. The box itself fits a 60ml e-liquid bottle nicely but there is something that sets this brand apart. Each flavor of the brand is represented by artwork of different types of warriors from all around the world and throughout time (Viking, Samurai, Spartan, etc.). The front of the box is the warrior in their "Victory" pose and the back is the warrior in their "Defeat" pose. Each box has 2 bottle sized holes on the perpendicular sides where a customer could pull the bottle out of the box (from the top), slip the bottle through the holes, and spin the box around the bottle to play a game of chance with friends or family... WILL YOUR WARRIOR BE DEFEATED OR WILL HE TASTE VICTORY... the Battle Royale will decide.